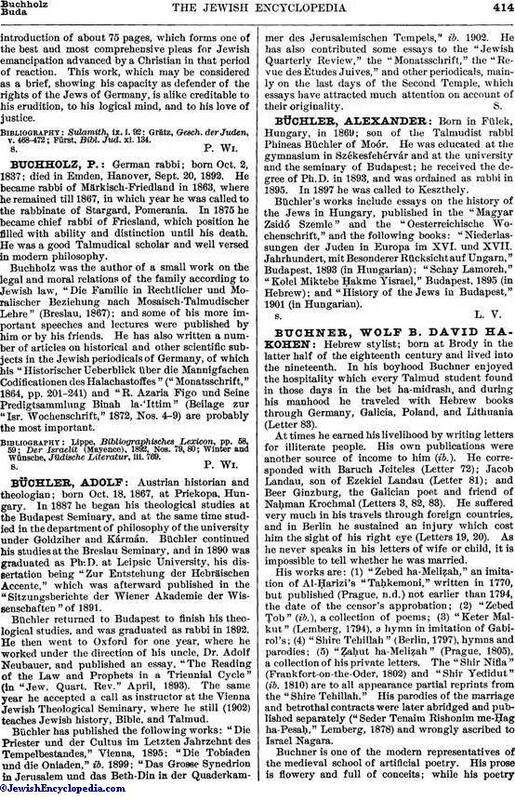 German Christian lawyer and author; born in the latter half of the eighteenth century; died at Lübeck Nov. 15, 1843. He was a doctor of laws and of philosophy, and, at the time of his death, occupied the position of second "Stadt-Syndicus" of Lübeck. Although that city was notorious for its hostility to the Jews, both before and after the Napoleonic wars, Buchholz, who was one of its leading citizens, voluntarily undertook to champion their cause in a work entitled "Ueber die Aufnahme der Jüdischen Glaubensgenossen zum Bürgerrecht" (Lübeck, 1814; 2d ed., Leipsic, 1816). This led to his being selected by the Jewish communities of the three Hanse towns (Lübeck, Hamburg, and Bremen) as their representative at the Congress of Vienna (1815), where he rendered valuable service. He was also sent as representative of the foregoing Jewish communities to the German Diet at Frankfort. 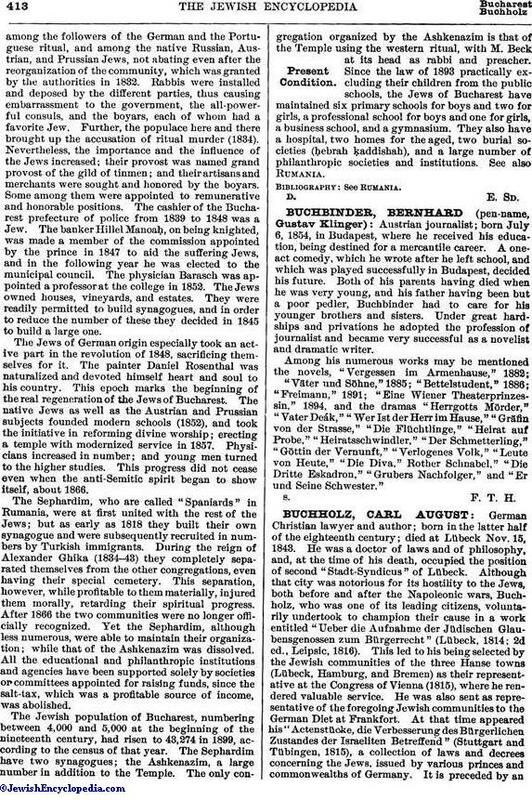 At that time appeared his "Actenstücke, die Verbesserung des Bürgerlichen Zustandes der Israeliten Betreffend" (Stuttgart and Tübingen, 1815), a collection of laws and decrees concerning the Jews, issued by various princes and commonwealths of Germany. It is preceded by anintroduction of about 75 pages, which forms one of the best and most comprehensive pleas for Jewish emancipation advanced by a Christian in that period of reaction. This work, which may be considered as a brief, showing his capacity as defender of the rights of the Jews of Germany, is alike creditable to his erudition, to his logical mind, and to his love of justice. Fürst, Bibl. Jud. xi. 134.